How does a prominent market player like Nuon – the second largest utility in the Netherlands after RWE-subsidiary Essent – cope with the energy transition? “I am not saying nothing is being done. They do look at innovations in sustainability, from smart applications to delivering services to energy cooperatives. But most emphasis is on wind energy. 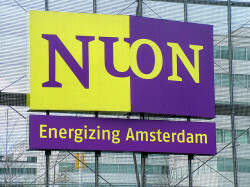 This is something that the management of a traditional company like Nuon understands best. Why? Because like a power station a wind park is a centralised form of electricity generation which requires a lot of capital and skills. And it allows the company to maintain control over its means of production. The identity of the person quoted in the article is known to the editor. If you want to comment on the article or supplement it, or if you want to tell your own story, please leave a comment on send an email to hendriksteringa@gmail.com or call him at +31 (0)6 41091639 (anonymity is assured). The article above was first published in Dutch by FD Energie Pro on 4 March 2015. How do energy professionals deal with the energy transition? Hendrik Steringa, Ph. D. researcher Univ Leiden (formerly Univ Twente), has conducted interviews about this with dozens of lobbyists and senior staff at Dutch energy companies. Now he takes his research project to Europe: to Brussels and other cities. His interviews will be published here on Energy Post. Would you like to participate in Hendrik’s project on a strictly anonymous basis? Then please send an email to hendriksteringa@gmail.com or call him at +31-6-41091639.